Thousands of marchers, moved by stories of children being separated from their families at the US-Mexico border, converged in Boston on Saturday to denounce President Trump’s immigration policies as draconian measures that violate human decency and compassion. 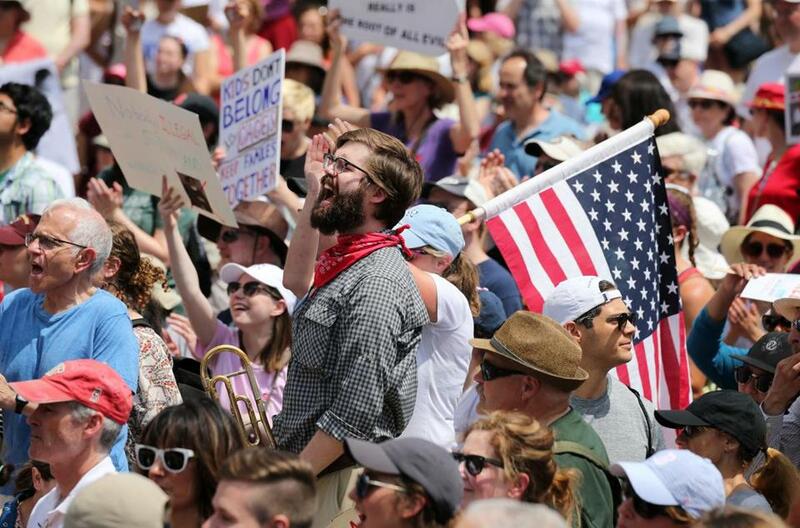 A rally and march in the city’s downtown brought families out in force as parents pushed children in strollers and carried babies amid a sea of signs evoking the dark images emerging from detention facilities on the country’s southern border. “No more kids in cages,” read one sign. “Don’t jail children,” was written on another. The protest was among hundreds staged across the country in the latest outpouring of resistance against Trump’s immigration agenda. The Boston event began with a rally on City Hall Plaza followed by a march to Boston Common, where protesters staged a second demonstration. It was organized by a coalition of civil rights and activist groups who support due process rights for detained immigrants and want to abolish family separations and detentions in the immigration system. Police Commissioner William B. Evans estimated about 5,000 demonstrators participated in the event, though organizers said the crowd exceeded 15,000. Supporters gathered in front of the jail that houses undocumented immigrants. No one was arrested, a Boston police spokesman said. The demonstration unfolded under intense heat, which affected some marchers, two of whom were taken to area hospitals for heat-related symptoms, according to Boston Emergency Medical Services Chief James Hooley. Six others were evaluated on City Hall Plaza, he said. The marchers spoke out against using local police to enforce federal immigration law and criticized Trump’s ban on travel from several majority-Muslim countries, a policy that the US Supreme Court endorsed in a 5-4 decision issued Tuesday. Sirley Silveira Paixao, a 30-year-old Brazilian immigrant, said she traveled to the US-Mexico border at the end of May with her 10-year-old son, Diego, to seek asylum. But US officials split them up, Silveria Paixao said, and sent the boy to Chicago, where he has been living for more than a month. Lydia Nakiberu, a Ugandan immigrant and leader with the Matahari Women Workers’ Center in Boston, said officials from US Immigration and Customs Enforcement descended on her house six years ago and arrested her husband, who is undocumented. Nakiberu said her husband was detained in front of the couple’s two older children, who were traumatized. As a result of his arrest, Nakiberu said her husband, who she declined to name, missed the birth of their youngest son, Judah, who is 6 years old. “Even though this happened years ago, my children still to this day are scared that at any moment ICE will come for their parents,” she said. The latest outcry over Trump’s immigration tactics began with the implementation of a “zero tolerance” policy that required criminal prosecution for all adults caught crossing the border illegally. The approach resulted in a spike in family separations yielding searing images of children held in cages at border facilities and audio recordings of young children crying for their parents. Outrage over the policy prompted Trump to reverse course and sign an executive order on June 20 that ended the practice of separating families while maintaining measures mandating criminal prosecution for adults stopped crossing the border illegally. Now families are kept together while they are in custody. 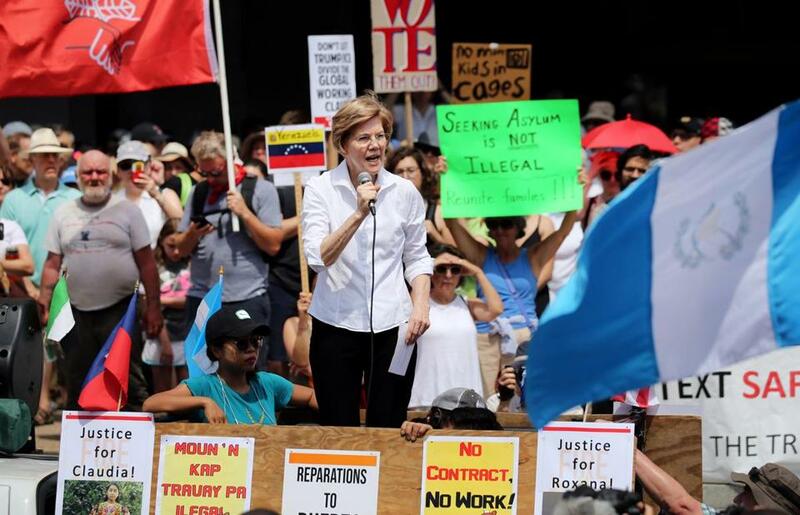 While visiting the US-Mexico border, Warren said she saw people locked in cages and talked to mothers who had been separated from their children. US Senator Elizabeth Warren spoke to the crowd on Saturday. US Senator Edward J. Markey, who also spoke at City Hall Plaza, said he plans to visit the southern border on Sunday and Monday. He said he’s bringing homemade cards created by children in Massachusetts to distribute among children in detention facilities. Trump’s immigration policies are hateful and pass judgment based on people’s race, color, and country of origin, Markey said. US Representative Joseph P. Kennedy III said children belong with their parents. Boston Free Speech claims to promote open dialogue, but civil rights advocates say it is linked to people who espouse racial hatred and violence. The group staged a rally on Boston Common in August 2017 that was overwhelmed by throngs who spoke out against Nazis, racism, the Ku Klux Klan, and fascists. The two groups were separated by police officers. 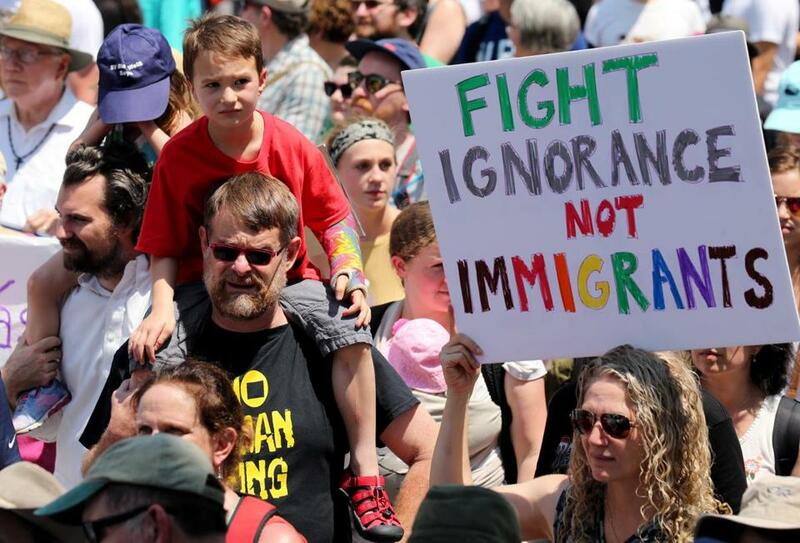 Steve Kropper, co-chairman of the Massachusetts Coalition for Immigration Reform, criticized the counterprotesters, saying most anti-immigration activists in the state are centrists who oppose separating immigrant families and reject Trump’s policies. His group advocates for reduced legal immigration and a strong law enforcement response to illegal immigration. Trump “is making a bad name for thoughtful participants in the immigration debate,” Kropper wrote in an e-mail. Demonstrators cheered during Saturday’s rally. 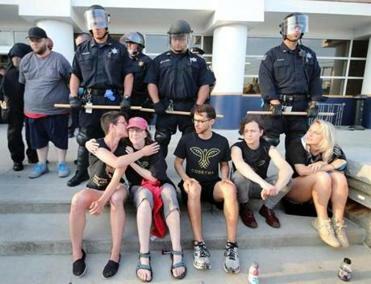 Smaller demonstrations against family separation also brought protesters to separate gatherings at the New England Holocaust Memorial in Boston and the South Bay House of Correction. More than 100 medical practitioners gathered near the Holocaust memorial to voice their support for keeping families together. Some demonstrators wore their white medical coats. “Part of my job is working with families, and the thought of ripping any kid from their parents is heartbreaking,” said Dr. Katie Brigham, a pediatrician at Massachusetts General Hospital. Karla Rojas, 24, an undocumented immigrant from Mexico, participated in a late-afternoon march to the South Bay House of Correction, which houses some immigration detainees. Back on Boston Common, J.N. Burke wore an olive green dress with the words “I Really Do Care, Shouldn’t U?” painted on the back. 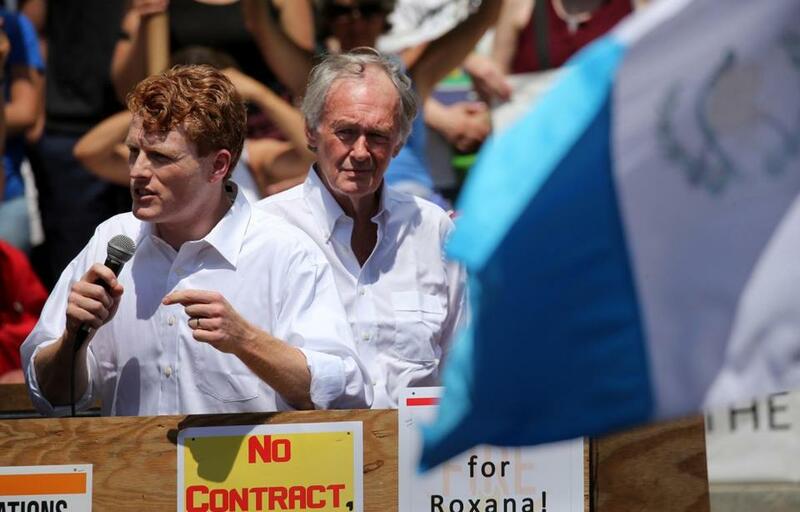 US Representative Joseph P. Kennedy III and US Senator Edward Markey addressed the demonstrators on Saturday. Demonstrators marched from City Hall Plaza to Boston Common on Saturday. Globe correspondents John Hilliard and J.D. Capelouto contributed to this report. Laura Crimaldi can be reached at laura.crimaldi@globe.com. Follow her on Twitter @lauracrimaldi. Correction: Because of a reporting error, an earlier version of this story misspelled the name of a Brazilian immigrant who was separated from her son at the US-Mexico border.